Of course there are a million different recipes with chocolate that I could have featured this month, but I decided to go with one of Ina Garten’s recipes again. This is apparently one of “the best chocolate cakes, ever!” So let’s see! Preheat the oven to 350 degrees and prepare two 8 inch round cake pans (should also be at least 1 ½ inches deep) by first lining them with Parchment Paper, grease them with a little Butter and then shake some Flour into each tin, tapping it gently all around so the bottoms and sides are lightly covered before shaking the excess out. Sift the Flour, Sugar, Cocoa Powder, Baking Soda, Baking Powder and Saltinto the bowl of an electric mixer fitted with a paddle attachment and mix on low speed until combined. If you do not have an electric mixer, then I am sure this recipe could be made successfully by using a large mixing bowl and some “elbow grease!” In another bowl, combine the Buttermilk, Vegetable Oil, Eggs and Vanilla Extract. With the mixer on low speed, slowly add the wet ingredients to the dry. If you are mixing by hand, then fold the wet ingredients into the dry without over-mixing. With mixer still on low, add the Coffee and stir just to combine, scraping the bottom of the bowl with a rubber spatula. Pour the batter into the prepared pans and bake for 35 to 40 minutes, until a cake tester comes out clean. A cake tester can simply be a toothpick or a thin wooden kebab skewer. Cool the cakes in the pans for 30 minutes before turning them out onto a cooling rack and cool completely before frosting. You may have your own chocolate frosting recipe that you prefer, but here is the one recommended for this particular cake. Don’t make the frosting until the cakes have cooled completely, then place one cake (top side down) on a plate, spread approximately 1/3 of the frosting on that layer, then place the other cake (top side up) on top, and spread the remainder of the frosting on to the top and sides of the cake until it is completely covered. Place the Chocolate in a heatproof bowl set over a pan of simmering water. Stir until it has just melted and then set aside until it has cooled to room temperature. In the bowl of an electric mixer (or again, in a large bowl if you are mixing by hand) fitted with a paddle attachment, beat the Butter on medium-high speed until light yellow and fluffy, about 3 minutes. Add the Egg Yolk and Vanilla Extract and continue beating for 3 minutes. Turn the mixer to low, gradually adding in the Confectioner’s Sugar, then beating at medium speed, scraping down the bowl as necessary, until smooth and creamy. Dissolve the Coffee Powder in 2 teaspoons of the hottest tap water. (If you don’t have any instant Coffee, then use a tablespoon of strong, fresh-brewed Coffee.) 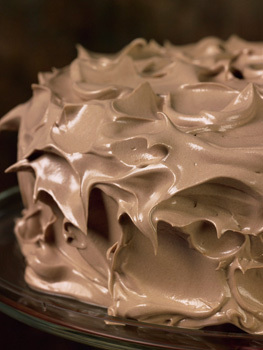 On low speed, add the melted Chocolate and Coffee to the frosting mixture and combine until blended. Don’t whip! Spread immediately on the cooled cakes.